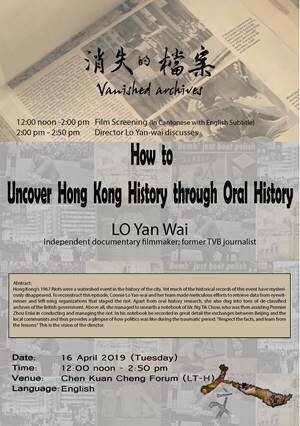 “Vanished Archives” is a documentary on Hong Kong’s 1967 Riots, which was considered as a watershed in the history of the city. Yet much of the historical records of this event mysteriously disappeared. To reconstruct this episode, Director Connie Lo Yan-wai and her team spent meticulous effort to retrieve data from eyewitnesses, and left wing organizations that staged the riot. Apart from oral history research, she also dug into tons of de-classified archives of the British government. Above all, she managed to unearth a notebook of Mr. Ng Tik Chow, who was then assisting Chinese premier Zhou Enlai in conducting and managing the riot. In his notebook he recorded in great details the exchanges between Beijing and the local communists and thus provides a glimpse of how politics was like during the traumatic period. “Respect the facts, and learn from the lessons.” This is the vision of the director.